I love children’s picture books — especially the classic, old-fashioned ones with their big, grand illustrations. (Maybe it’s what we think of when we think of a book, in some ways, because it reminds us of the first books we ever read as a child.) So I was really excited when the Kindle actually rescued four of my favorite children’s books from their out-of-print status. And then this week, the granddaughter of their original author/illustrator even agreed to do an interview! “You reviewed a few of my grandfather, Robert Bright’s books in the past,” read her mysterious e-mail. “It was so wonderful to know that the books are still loved…” Now Sara Ruffin is reviving her grandfather’s books, both in print and in digital editions, and to do it she’s launched her own publishing company, which is selling a lovely print edition of her grandfather’s very first children’s book, The Travels of Ching, originally published in 1943. But because of the low cost of publishing on the Kindle, she was also even able to release digital Kindle editions for four more of her grandfather’s books — including two about Georgie the Ghost! “Kindle is indeed helping to keep Georgie in circulation!” she told me this morning, adding “I love that about this technology. It seems this must be true for so many writers and illustrators. 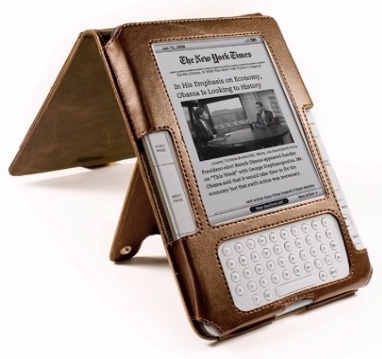 I have this belief that electronic books will complement the physical book. It seems to be true, because I’d first discovered Robert Bright through a hardcover edition at my local public library of a delightful book he wrote and illustrated about Georgie the Ghost. 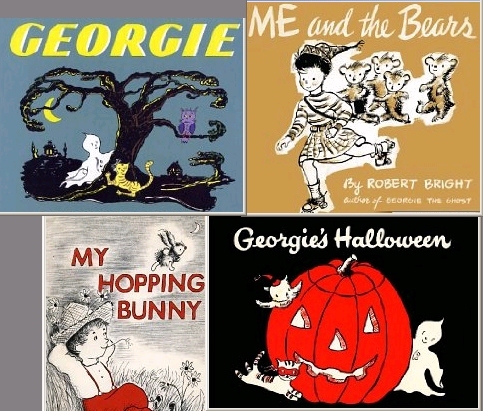 Sara remembers that originally, her grandfather’s idea for the Georgie books “started when my mother and my uncle [then small children] were caught peering under the bed one evening in Laguna Beach in 1941. They were looking for the little ghost that lived in the house – they weren’t scared at all, only extremely curious!” And nearly 70 years later, that book (and a sequel, Georgie’s Halloween) are now available again on the Kindle! 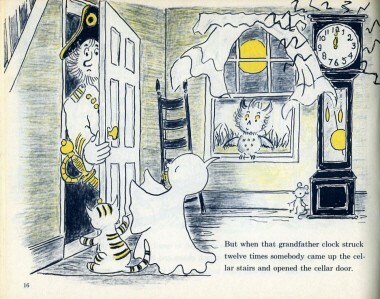 Georgie’s Halloween was always one of my favorites, because the illustrations are colored with orange and black, giving them a special holiday feeling. (“Bright really outdoes himself with this book’s illustrations,” I wrote in my review, praising the way that light and shadows were suggested in the scenes with moonlight or a night-time party.) All the white space on the page seemed to become the gleam of moonlight on Halloween. And the dark lines turn into stark and shadowy highlights — complemented by the orange in the children’s costumes – so I’m really looking forward to reading its Kindle edition in color on my Kindle Fire! Of course, there’s also a Kindle edition of the first book in the series, Georgie the Ghost, where we first meet the shy, magical character who hides in Mr. and Mrs Whittaker’s attic. But you can also buy Kindle editions now for two fun picture books that Bright wrote about children and animals — My Hopping Bunny and Me and the Bears. Amazon’s created a web page listing all the picture books written by Robert Bright — but unfortunately, they’ve all since gone out of print. That’s why it’s inspiring to see that his granddaughter is keeping the books alive – with a little help from the Kindle!